This is shaping up to be a pretty cool day. Ok, so I got a gamma (like, a C-ish) on another lab, I didn’t win even a doughnut let alone a car, and my digital camera seems to have finally kicked the bucket, but it’s sunny, I’m home early, I have no assignments due this week, I have HY playing obscenely loud, my balcony door is open, I’m going to bake some cookies, and I just bought Kosmic the Kodak Kolorkin for a dollar at some random store on Wellington St! I would have posted a picture of it, but remember my camera is dead. 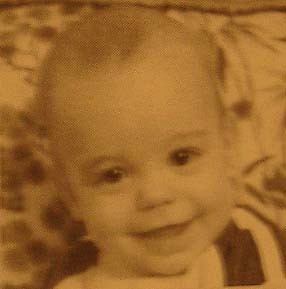 So, instead, I will post a picture of myself as a baby.